Draft: 1999, Arizona Diamondbacks, 8th rd. November 3, 2016 LHP Chris Capuano elected free agency. November 3, 2016 Milwaukee Brewers activated LHP Chris Capuano from the 60-day disabled list. 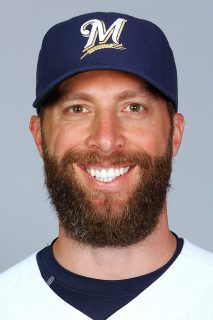 July 4, 2016 Milwaukee Brewers transferred LHP Chris Capuano from the 15-day disabled list to the 60-day disabled list. Left elbow flexor strain. April 2, 2016 Milwaukee Brewers selected the contract of LHP Chris Capuano from Colorado Springs Sky Sox. January 26, 2016 Chris Capuano assigned to Colorado Springs Sky Sox. January 25, 2016 Milwaukee Brewers signed free agent LHP Chris Capuano to a minor league contract and invited him to spring training. November 2, 2015 LHP Chris Capuano elected free agency. October 7, 2015 New York Yankees activated LHP Chris Capuano. October 6, 2015 New York Yankees reassigned LHP Chris Capuano to the minor leagues. September 7, 2015 New York Yankees selected the contract of LHP Chris Capuano from Scranton/Wilkes-Barre RailRiders. August 28, 2015 New York Yankees sent LHP Chris Capuano outright to Scranton/Wilkes-Barre RailRiders. August 26, 2015 New York Yankees designated LHP Chris Capuano for assignment. August 24, 2015 New York Yankees activated LHP Chris Capuano. August 22, 2015 New York Yankees designated LHP Chris Capuano for assignment. August 18, 2015 New York Yankees selected the contract of LHP Chris Capuano from Scranton/Wilkes-Barre RailRiders. August 17, 2015 New York Yankees sent LHP Chris Capuano outright to Scranton/Wilkes-Barre RailRiders. August 15, 2015 New York Yankees designated LHP Chris Capuano for assignment. August 12, 2015 New York Yankees selected the contract of LHP Chris Capuano from Scranton/Wilkes-Barre RailRiders. July 31, 2015 New York Yankees sent LHP Chris Capuano outright to Scranton/Wilkes-Barre RailRiders. July 29, 2015 New York Yankees designated LHP Chris Capuano for assignment. May 17, 2015 New York Yankees activated LHP Chris Capuano from the 15-day disabled list. May 7, 2015 New York Yankees sent LHP Chris Capuano on a rehab assignment to Scranton/Wilkes-Barre RailRiders. May 2, 2015 New York Yankees sent LHP Chris Capuano on a rehab assignment to Tampa Yankees. December 16, 2014 New York Yankees signed free agent LHP Chris Capuano. October 30, 2014 LHP Chris Capuano elected free agency. July 25, 2014 New York Yankees activated LHP Chris Capuano. July 24, 2014 Colorado Rockies traded LHP Chris Capuano to New York Yankees for cash. July 18, 2014 LHP Chris Capuano assigned to Colorado Springs Sky Sox from Tulsa Drillers. July 15, 2014 LHP Chris Capuano assigned to Tulsa Drillers from Colorado Springs Sky Sox. July 5, 2014 LHP Chris Capuano assigned to Colorado Springs Sky Sox. July 4, 2014 Colorado Rockies signed free agent LHP Chris Capuano to a minor league contract. July 1, 2014 Boston Red Sox released LHP Chris Capuano. June 25, 2014 Boston Red Sox designated LHP Chris Capuano for assignment. February 22, 2014 Boston Red Sox signed free agent LHP Chris Capuano. October 31, 2013 LHP Chris Capuano elected free agency. October 21, 2013 Los Angeles Dodgers activated LHP Chris Capuano. October 11, 2013 Los Angeles Dodgers reassigned LHP Chris Capuano to the minor leagues. June 19, 2013 Los Angeles Dodgers activated LHP Chris Capuano from the 15-day disabled list. June 14, 2013 Los Angeles Dodgers sent LHP Chris Capuano on a rehab assignment to Albuquerque Isotopes. May 6, 2013 Los Angeles Dodgers activated LHP Chris Capuano from the 15-day disabled list. May 1, 2013 Los Angeles Dodgers sent LHP Chris Capuano on a rehab assignment to Albuquerque Isotopes. April 17, 2013 Los Angeles Dodgers placed LHP Chris Capuano on the 15-day disabled list. Left calf strain. December 2, 2011 Los Angeles Dodgers signed free agent LHP Chris Capuano. October 30, 2011 LHP Chris Capuano elected free agency. January 3, 2011 New York Mets signed free agent LHP Chris Capuano. November 7, 2010 LHP Chris Capuano elected free agency. May 29, 2010 Milwaukee Brewers selected the contract of LHP Chris Capuano from Nashville Sounds. May 11, 2010 Chris Capuano assigned to Nashville Sounds from Brevard County Manatees. April 26, 2010 Chris Capuano assigned to Brevard County Manatees from Nashville Sounds. April 8, 2010 Chris Capuano assigned to Nashville Sounds from Milwaukee Brewers. November 28, 2009 Milwaukee Brewers signed free agent LHP Chris Capuano to a minor league contract and invited him to spring training. November 9, 2009 LHP Chris Capuano elected free agency. September 12, 2009 Nashville Sounds activated LHP Chris Capuano from the 7-day disabled list. August 31, 2009 AZL Brewers sent LHP Chris Capuano on a rehab assignment to Helena Brewers. August 19, 2009 Chris Capuano assigned to AZL Brewers.